New Office Measurement Guidelines – Buildings Are About to Grow. Most office tenants that have signed a commercial lease have probably heard of the Building Owners and Managers Association or “BOMA”. BOMA is an international organization founded in 1907, with members comprised of varied real estate professionals that range from property developers to corporate facilities managers. This association provides multiple services and resources for its members that include information on building management and operations, development, leasing, building expenses and operating costs, energy consumption patterns, local and national building codes, legislation, occupancy statistics, technological developments and other industry trends. Did you notice who wasn’t represented in BOMA’s list of stakeholders? The office Tenant. There is no reference to advocating for the Tenant in BOMA’s mission statement, which frankly, we don’t take issue with, but believe that it’s important to point out. The purpose of this post it to provide some transparency to our followers as to whom BOMA truly supports – and it’s not the Tenant. One of BOMA’s most significant roles is to provide “guidelines” or “standards” on how a commercial office building or specific suite is or should be measured. In fact, most office leases on the West Coast reference BOMA measurement standards within the lease language as a standard for said measurements. Unfortunately, these measurement standards continuously change, and they change to favor the Landlord. Many landlords are beginning to use “Modified BOMA” measurements specifications in an effort to allocate building common areas to specific suites because of design inefficiencies. These standards are important as they define the way the landlord can pass on the operating costs of the common areas of the building along to the tenant – the difference between usable square footage (carpetable space) vs rentable square footage (which includes usable square footage plus a proportionate share of the common areas). 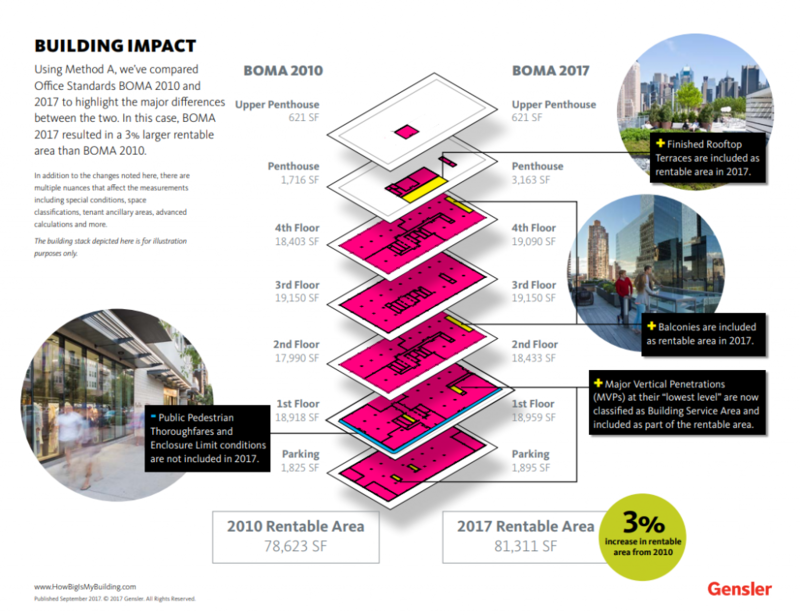 In October, BOMA released its latest revision of its Office Standard for measuring rentable square footage for both existing and new office buildings. The BOMA 2017 Office Standard has two significant changes that negatively impact the tenant. These changes involve the inclusion of major vertical penetrations, private balconies, covered galleries and roof top terraces into the usable space calculation. 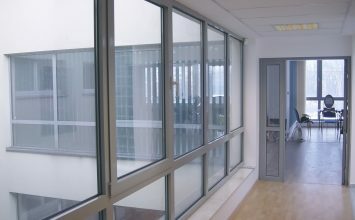 While these changes will have a negative impact on the tenant, the new standard does allow for the allocation of common area amenities or building areas such as conference rooms and loading docks that are used by a specific tenant or group of tenants, rather than simply allocating such spaces to an entire floor or to the entire building. This change allows for a more detailed level of allocation and will ensure that tenants are not paying for space within the building that they do not directly benefit from. This change will be a win for some tenants. With the increased demand for highly amenitized spaces in today’s marketplace, private balconies, covered galleries and roof-top terraces are in high demand. Landlords can now attempt to include these areas in the gross rentable space calculations and realize income from them whereas they had previously been viewed as an amenity to the space. Tenants that currently have these types of spaces, should pay particular attention to the BOMA language at the time of a lease renewal as landlord’s may attempt to insert this new BOMA standard into the document for their benefit. Don’t accept the Landlord’s “it’s market”, or “it’s standard”, argument; while it may be a measurement standard, well-represented tenants are pushing back. “Vertical penetrations” are the areas in the common areas of a building such as elevator shafts and stairwells. In the previous BOMA standard, vertical service areas such as a pipe or mechanical shafts were included in the rentable area calculation, but vertical circulation areas such as stairwells and elevator shafts were not. The new 2017 standard allows for ground floor elevator shafts on lower levels to be added to the rentable square footage of the building, with the reasoning being that the lowest level is a public space and should be rented. International architectural and design firm Gensler has created a terrific illustration comparing the BOMA 2010 vs 2017 Office Standards, it provides a great visual comparison if the most recent changes. It is common practice for an owner to remeasure an office building, and it typically happens before the sale of a property, after an acquisition of a property, or while repositioning a building or project within the market. It’s very rare that a building gets smaller; they typically or “magically” tend to grow. Although the physical structure of the building remains the same, measurement standards have created new ways for landlords to increase the income associated with a property. There was an article written in the May 27, 2014 edition of the Wall Street Journal, titled “Building Owners Brace for Tall Order: One Way to Measure Space” that discusses this very issue., The Met Life Building (formally the Pan Am Building) in New York City, built in 1960, was originally recorded as 2.4M square feet. While we suspect that the building is not measured to any BOMA standard today (New York City uses its own method published by the Real Estate Board of New York), the tower now registers at over 3M square feet. While landlords might choose to adopt these revised 2017 Standards, they are not obligated to. As such, it’s important to understand the differences between the 1996, 2010, or 2017 Standards and which BOMA standard the landlord is attempting to use in your lease. A well-represented tenant in today’s marketplace will reserve the right to facilitate an independent measurement of the space before a lease is signed. This allows the tenant to confirm the space measurement being utilized in the lease document is consistent with the actual measurement of the space. Additionally, the lease form being utilized should not allow the landlord to re-measure the space during the lease term. Remember, BOMA is a landlord friendly, non-tenant advocacy organization and its mission is to make its members more profitable. Tenants need to understand this when negotiating and renewing their leases.